Hi everyone! 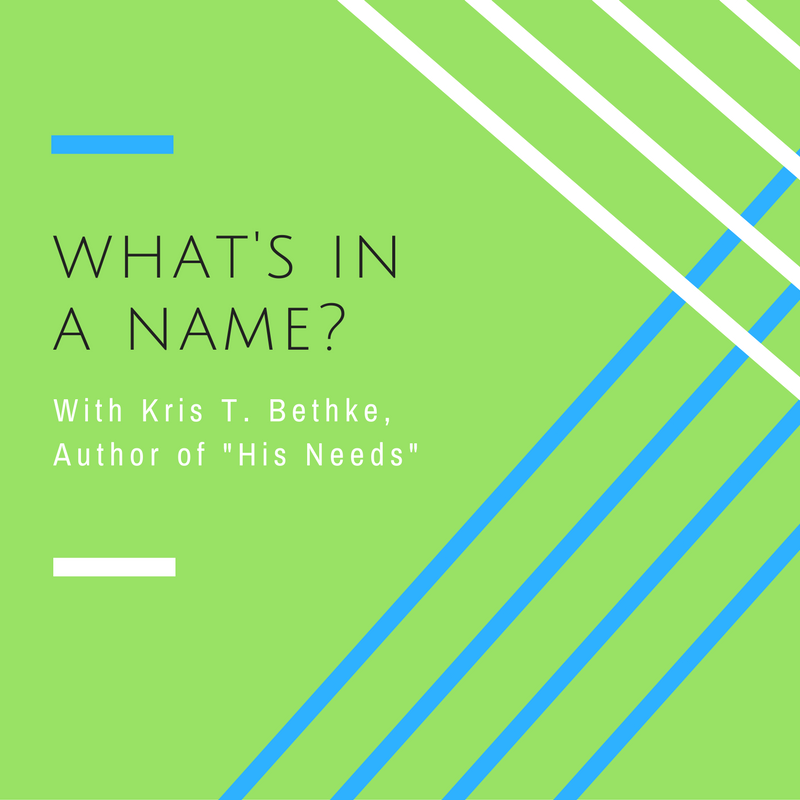 I’m Kris T. Bethke, and I’m here to talk about my newest release, His Needs. This is Travis and Noah’s love story, and I loved writing it. I’m just not entirely sure of what started it. It’s been almost a year now since I began penning the tale. I knew I wanted to write another holiday book, so that was definitely a given. And I knew I wanted to hit on a few of my favorite tropes. Friends to lovers, with a bit of a twist, and hurt/comfort. My sister had surgery and was hopped up on painkillers for a week, and since I was her primary caregiver during that time, I got to see the brain-to-mouth filter dissolve, the aches as she moved, and help her not fall over in the shower. I was knitting a lot as a way to decompress in my spare time. So I had all these bits floating around, but that’s pretty much my every day. I don’t quite remember exactly what made them coalesce into a story. I have a fairly good feeling it was Travis’s name. I’m a linear writer. I start at the beginning, with the very first word, and write through to the end. But I can’t get started at all until I know what my characters are called. Travis is my narrator, so it was especially important I know who he was. And until I did, I wouldn’t be able to pull all those pieces together and weave a tale. In my evil day job, I see a lot of names. A lot. And I’m always taking note of an interesting one, or one that catches my eye. I’ve long been a name collector, a good twenty years now, so it’s impossible for me to shut this habit off. These days it comes in handy quite frequently. I’m also rather…picky about the names I choose. It needs to fit the character, and has to be one I actually like. This is harder for me than most people, and I will admit that I’m kind of ridiculous when it comes to characters’ names. But it’s important to me to put the time in, to figure out the best one for each character. Even the secondary and tertiary for that matter. Every single one gets thought. So how did I arrive at Travis Kinslow for my MC? Last name first, of course. I saw it on the page, and I instantly liked the way it sounded. I knew it was one I needed to keep. But as I thought about it more, I started seeing the character in my brain. An officer of some sort. Officer Kinslow sounded great to my ear. A little bit of research, and I quickly chose State Troopers. And once I knew Officer Kinslow was a trooper, the beginning scene unfolded in my brain. He’d been hurt, and he had the concern of a family that was not his by blood. But I couldn’t call him Officer Kinslow throughout the whole book. My blond, blue-eyed trooper needed a first name. I know I tried my name app, checked my running list, and even searched through the names at work. I can’t remember if I found it and ran it by the BFF, or if he suggested it in the first place, but I know he was involved. In the end, it doesn’t matter, because I had a name. And with that name I had a personality, a backstory, a complete unfolding of the character’s life. Who he was. What he wanted. How he felt and reacted. He was my narrator, the guy who would tell me how he fell in love with his best friend’s little brother, and how he wanted nothing more than to be Noah’s forever. I found it easy to slip into Travis’s head and tell his story. Once I had his name, the rest of it fell into place. And Noah? Well I know for a fact the BFF chose his name, offering it up as a suggestion when I described the character, and it fit so perfectly there was no going back. I didn’t want to. It was exactly the right name for the guy. And in the end, Travis and Noah are perfect for each other. What about you? Are names in the stories you read important? Can a name make or break a story for you? Let me know what you think in the comments below! Check out His Needs today!